1 University of Kent, Durrell Institute for Conservation Ecology, Marlowe Building, CT2 7NR, Canterbury, Kent, England. 2 Current address: Benemérita Universidad Autónoma de Puebla, Instituto de Ciencias, Departamento Universitario para el Desarrollo Sustentable, 14 Sur 6301, Colonia San Manuel, Ciudad Universitaria, 72570 Puebla, Puebla, México. 3 University of Queensland, School of Biological Sciences, Brisbane St Lucia, QLD 4072 Queensland, Australia. Areas with high vegetative diversity tend to be threatened by habitat fragmentation and other human disturbances (Myers, 1988). This is serious because fragmentation diminishes biodiversity (Collinge et al., 2003), given that species composition on a patch will depend on its size and isolation (Crooks, 2002). Some of the negative effects of disturbances that have been reported are the following: soil fertility loss and erosion (Wezel and Rath, 2002), less vegetative (Nikiema, 2005) and fauna diversity (Blaum et al., 2007), favoring the establishment of invasive species (McDougall and Turkington, 2005) and brush encroachment (Van Auken, 2000), amongst others. In central Mexico, the information about such effects in arid regions is limited to records of specific impacts in small areas (e.g. Giordani, 2008; Parra et al., 2008). This kind of information is necessary in the semi-arid area of Cerro Colorado that, being adjacent to the Tehuacán-Cuicatlán Biosphere Reserve, can be considered as highly biodiverse (Fig. 1). The region is highly heterogeneous, with more than 26 vegetation assemblages that can be grouped in tropical shrubland, as well as oak and pine forest (Valiente-Banuet et al., 2000). This area is important to conservation given its potential to serve as corridor for many species (Ramírez-Bravo, 2010). However, it is exposed to strong human pressure, with activities such as livestock grazing (Giordani, 2008), wood cutting (Pérez-Negrón and Casas, 2007), and extraction of non-timber products such as fruits (González-Soberanes and Casas, 2004; Pérez-Negrón and Casas, 2007; Parra et al., 2008). Although these activities have been considered to have low environmental impact, Pérez-Negrón and Casas (2007) suggested that, in some communities, cactus fruit collection can total 151 kg/year and wood extraction for fuel can be more than 400 tons/year. Therefore, these activities have the potential to shift species diversity and composition resulting in direct species loss (Osem et al., 2002) or favoring the establishment of invasive species, either exotic or native (Valéry et al., 2004; Blaum et al., 2007) that could be used as indicator species. Figure 1: Map of the study area, showing the Tehuacán-Cuicatlán Biosphere Reserve and Cerro Colorado. The main goal of this study was to develop a simple disturbance index that could be used in the area, as well as to determine the existence of indicator species that will allow quick conservation assessments. For this, we used species that have been recorded as indicators of human disturbances and that are known to encroach upon arid areas such as Acacias (Blaum et al., 2007) and Mimosas (Legesse, 2010). In southeast Puebla, located in central Mexico, our study area known as Cerro Colorado is adjacent to the Biosphere Reserve “Tehuacán-Cuicatlán” (Fig. 1). It has an area of 224.25 km2, with a centroid in the coordinates 18°27'54"N, 97°18'58"W. It has different mountain ranges, with elevations between 600 and 2950 m asl that allow great habitat diversity. Despite the variety of vegetation association in the region, the National Forestry Inventory (SEMARNAP, 2001) identifies three main habitat types, which include tropical dry forest, shrubland, and oak and pine forest. Very distinct from its dry season, its wet season occurs from May to October and has an average precipitation of 250 to 500 mm. Its temperature ranges between 18 and 22 ºC (Botello et al., 2006). We selected six study sites using a modified methodology based on Taki et al. (2007), where a hexagon is drawn in the center of a patch with the same vegetation type within the heterogeneous matrix using the vegetation map available from the National Commission for Knowledge and Use of Biodiversity (CONABIO). Each patch covered an area of 103 923 m2 and the minimum distance left between study sites was 2.5 km2. We coded each site according to nearby populations: three representing tropical dry forest (CM: Corral Macho, SB: San Esteban and SAC: San Antonio Cañada), and three from xeric shrubland patches (SD: San Diego, AJ: Ajalpan and VA: Colonia del Valle). Due to its restricted distribution in Cerro Colorado (less than 10%) (Bolaños-Bautista, 2011), as well as security problems by delinquent groups in these areas, oak and pine forest patches were not considered. We determined which activities were undertaken in Cerro Colorado based on bibliographical review, informal interviews with people in nearby areas and observation of activities during fieldwork. We evaluated disturbance considering ten different activities, which have been reported to be affecting natural resources in the area (Table 1). Following Espinosa et al. (2011), we visually evaluated each variable and gave it a value between zero and three depending on the activity intensity in each patch (Table 2). Disturbance values were obtained through the addition of the ten variables without giving difference to the impact of each variable (e.g. fruit collection vs. hunting), because the aim of the index is to be as simple as possible to be used by local communities for quick assessments. In order to differentiate between conserved and disturbed environments, we divided the maximum score of 30 in three categories: low disturbance, when it had values ranging between zero and ten; medium disturbance, with values between 11 and 20; and high disturbance, with scores between 21 and 30. Table 1: Principal disturbances and their examples in the Tehuacán-Cuicatlán Valley. Table 2: Activities used to obtain the disturbance index and categorization of each value. We conducted fieldwork during May-June 2011, as trees and shrubs are easier to count during this period. We characterized vegetation in 10 quadrats of 100 m2 in each of the six previously selected study sites by using a grid over the hexagon. This area covers 10% of each vegetation patch, which is considered as the minimum recommended area to determine species presence (Sánchez-Lalinde and Pérez-Torres, 2008). Vegetation characterization was based on trees and shrubs due to their relation with other species distribution such as carnivores (Palomares, 2001), and because they represent the principal vegetation component in this kind of habitat (Valiente-Banuet et al., 2000). We identified to genera and if possible to species level using specialized guides for the area (Guízar Nolazco and Sánchez Velez, 1991; Águilar and García, 2004; Téllez Valdés et al., 2008; Huerta Zamacona et al., 2009). To determine if the sampling effort was sufficient, we generated an accumulation curve using tree and shrub species from the different study sites using the statistical software EstimateS (Colwell, 2006). Next, all data was grouped to determine the sampling effort (number of quadrats) per vegetation type (i.e. shrubland and tropical dry forest), per disturbance level (i.e. high, medium, and low), and for the study area (i.e. Cerro Colorado). We calculated species richness or the number of species present in an area; its evenness, which indicates how equal a community is; as well as its Shannon diversity index, which considers the number of species and how evenly they are distributed (Moreno, 2001). These indices were determined using Diversity add-inn (SSC, 2012) for Excel, and compared using an ANOVA between the different patches using Statistica (Statistica, 1999). As in some cases identification was not possible to species level, we decided to use genera for further analysis except for Compositae and two shrub species that could not be identified and were grouped as Compositae and shrubs respectively. To determine similarities in species composition we used a nonparametric analysis of similarities test (ANOSIM) using the VEGAN software package, version 2.0-2 (Oksanen et al., 2011). This is a randomization-based analysis analogous to ANOVA, which builds a resemblance matrix that compares the species compositions of the sample groups of high and low disturbance (Ross, 2011). Results are indicated by R, which takes values between -1 and 1, where -1 indicates a random grouping while 1 indicates highest similarity. R is significant when its values are significantly different from zero. To find potential indicator species of low and high disturbance, we analyzed the similarity percentage (SIMPER) for tree species in both areas using the software PAST (Hammer et al., 2001). SIMPER is a nonparametric analysis that identifies how much species contribute to differences within groups (Clark and Warwick, 2001). As the interest of this study was to identify possible indicator species of disturbance along the observed gradient, we calculated species abundance per disturbance in each vegetation patch (high, medium and low in shrubland; and high, medium and low in tropical dry forest). We considered especially trees and arborescent shrubs as they are severely affected by anthropogenic factors (Pérez-Negrón and Casas, 2007; Hernández Hernández et al., 2010). As a consequence, differences in species composition and abundance should indicate conservation. Analysis was carried out at the genus level. The genera Acacia Mill. and Mimosa L. were also considered in the analysis because their encroachment capacity has been well documented (Van Auken, 2000). We conducted further analysis using Mexican oregano (Lippia graveolens Kunth), as well as the shrubs Cnidoscolus tehuacanensis Breckon and Mimosa luisana Brandegee, in order to determine their possible use as disturbance indicator species. where nij indicates the number of individuals of species i in patch j, and Nj represents the total number of individuals recorded in patch j. Differences between disturbance levels were calculated using an ANOVA (Statistica, 1999). If results were significant, post hoc comparisons were made using a Tukey HSD test. Activities recorded for the area ranged from food collection and hunting to mineral extraction activities. On the one hand, some of the activities are considered seasonal, occurring during specific times of the year; these include collection of fruits from different cacti species (Pavón and Briones, 2001), insects (Acuña, 2010), and plants for commerce (Dávila, 2003), as well as hunting. On the other hand, timber extraction occurs throughout the year for cooking and construction as well as grazing and hiking. Patches were classified according to the value obtained from adding the perceived level of the activity in the area (Table 3). Table 3: Patch classification according to disturbance level, scores vary according to the perceived disturbance. 1=low, 2=medium, 3= high. Patches were classified according to the score value, with the conserved or low disturbance sites those having scores of less than ten, medium conserved or disturbed sites the ones with scores up to 20 and disturbed sites those with a score of more than 20. CM, SB and AJ indicate patches of tropical dry forest while SD, VA and SAC indicate shrubland patches. Accumulation curves showed that sampling effort was not sufficient to determine overall plant diversity in Cerro Colorado (Fig. 2). Conversely, when considering the vegetation class “trees”, the accumulation curves showed that sampling effort was sufficient to account for tree diversity in the area (Fig. 3). 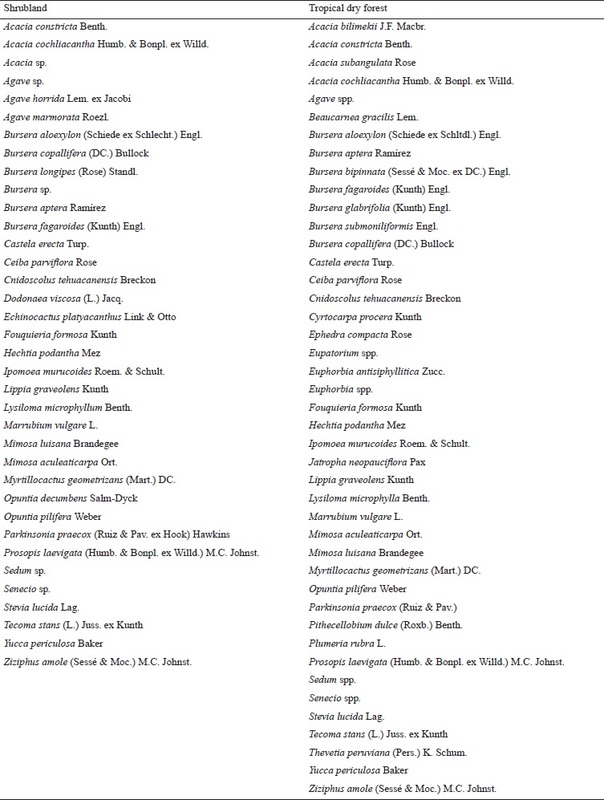 A list of the species that were identified in 60 quadrats can be found in Table 4. Tropical dry forest had more species than shrubland. When considering species richness between “high”, “medium”, and “low” disturbance areas; the species richness index (F=3.50, df=5,54, p<0.01) and evenness index (F=3.50, df=5,54, p<0.01) showed significant differences (Table 5), while the Shannon index (F=2.27, df=5,54, p=0.06) did not. Figure 2: Species accumulation curves using Mau Tau (Colwell, 2006) for shrubland and tropical dry forest (TDF) in Cerro Colorado. Data corresponds to 30 quadrats sampled on each vegetation type. Figure 3: Species accumulation curve using Mau Tau (Colwell, 2006) for Cerro Colorado considering all the species found in the 60 vegetation quadrats. 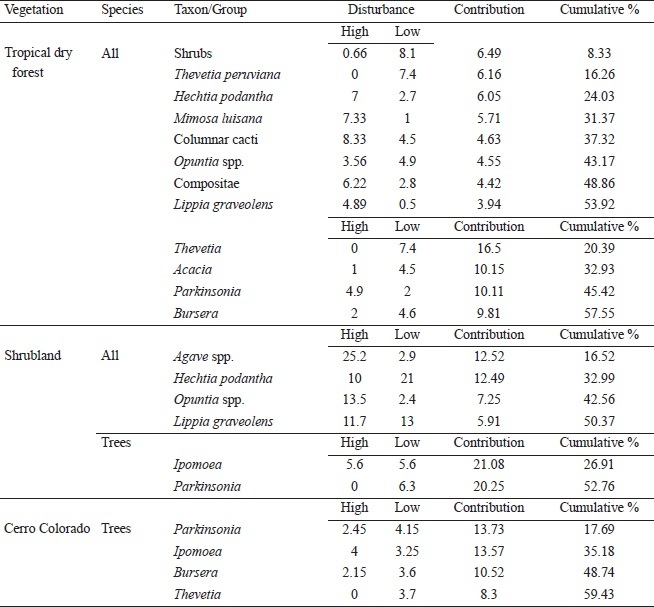 Table 4: List of principal species that were found in 60 quadrats surveyed in the six study sites in Cerro Colorado, grouped according to vegetation type. Identification was carried out with Guízar Nolazco and Sánchez Velez (1991); Aguilar Santelises and García (2004); Téllez Valdés et al. (2008) and Huerta Zamacona et al. (2009). Table 5: Comparison of vegetation quadrats made in each patch: Shannon index, species richness and species evenness given as average with standard deviation. Below, the ANOVA statistics, species richness and evenness are significant, with a difference among VA and CM. Despite similarity in vegetation richness among the vegetation patches, the ANOSIM analysis determined a significant difference between high disturbance and low disturbance areas in both vegetation types (shrubland global R=0.546, P<0.05; tropical dry forest global R=0.78, P<0.05). The SIMPER analysis of trees in Cerro Colorado identified four genera (out of 16 considered) that explained the top 50% of the compositional dissimilarity between high and low disturbance areas (Table 6). Of these, three genera (Parkinsonia L., Bursera Jacq. ex L., Thevetia L.) had greater average abundance in low disturbance quadrats and one genus (Ipomoea L.) in the high disturbance quadrats (Fig. 4). Table 6: Species contributing to the top 50% of dissimilarity in species composition between the high and low disturbance areas in tropical dry forest and shrubland, and Cerro Colorado ordered by proportional contribution. The table indicates results using all morphospecies and just tree genera. Contribution and cumulative values are given in %. For Cerro Colorado, results indicate just tree genera. Figure 4: Abundance of tree genera (bars) in shrubland vs. tropical dry forest in Cerro Colorado. The graph shows those genera that accounted for 50% of dissimilarity in genus composition between vegetation types, as identified by SIMPER analysis. When considering the 46 species present in tropical dry forest, the SIMPER analysis identified eight groups (shrubs, Thevetia peruviana K. Schum., Hechtia podantha Mez, Compositae, Mimosa luisana Brandegee, columnar cacti, Opuntia spp., and Lippia graveolens Kunth) that explain the top 50% of the compositional dissimilarity between high and low disturbance areas. Five taxa (Mimosa luisana, Columnar cacti, Compositae, Lippia graveolens, and Hechtia podantha) had a higher average abundance in high disturbance areas. In contrast, in low disturbance areas three groups (shrubs, Thevetia peruviana, and Opuntia spp.) presented higher average abundance. When considering trees in tropical dry forest (14 genera), four genera (Thevetia, Acacia, Parkinsona and Bursera) explained all the dissimilarity between high and low disturbance areas. Three of these genera (Thevetia, Acacia and Bursera) had a higher average abundance in low disturbance quadrats (Fig. 5). Figure 5: Abundance of tree genera in high disturbance vs. low disturbance in tropical dry forest in Cerro Colorado. The graph shows those genera that accounted for 50% of dissimilarity in genus composition between disturbance types, as identified by SIMPER analysis. When considering the 37 taxa present in shrubland, just four (Agave spp., Hechtia podantha, Opuntia spp., and Lippia graveolens) explained differences between high and low disturbance areas. When considering the class tree within shrubland (11 taxa), only two taxa (Ipomoea and Parkinsonia) explained the top 50% of the compositional dissimilarity; where just one tree (Parkinsonia) had a higher mean abundance in low disturbance areas (Fig. 6). Figure 6: Abundance of tree genera in high disturbance vs. low disturbance in shrubland in Cerro Colorado. The graph shows those genera that accounted for 50% of dissimilarity in genus composition between disturbance types, as identified by SIMPER analysis. Cerro Colorado had two species that could be used as indicators of places with high and low disturbance levels. The shrubs Mimosa luisana (F=5.68, df=2,56, p<0.05) and Cnidoscolus tehuacanensis (F=3.19, df=2,56, p<0.05) presented higher relative abundance in quadrats with high disturbance levels in comparison to those presenting medium and low disturbance levels. As for the tropical dry forest, three genera were significantly different: Acacia (F=3.77, df=2,27, p<0.05); Ceiba Mill. (F=12.55, df=2,27, p<0.05) and Cnidoscolus Pohl (F=4.41, df=2,27, p<0.05), being present in higher densities in low disturbance quadrats. As for shrubland, medium disturbance quadrats had three taxa that are significantly more abundant than in other quadrats: the tree Tecoma stans (L.) Juss. ex Kunth (F=3.38, df=2,26, p<0.05), the shrub Mimosa luisana (F=5.16, df=2,26, p<0.05), and the genus Acacia (F=3.77, df=2,26, p<0.05). On the other hand, Mexican oregano (Lippia graveolens) (F=4.08, df=2,26, p<0.05) was less abundant in medium disturbed patches. Finally, the shrub Cnidoscolus tehuacanensis (F=5.72, df=2,26, p<0.05) was present in higher numbers in high disturbance quadrats. Our results show that tropical dry forest in the area is more diverse than shrubland (40 vs. 26 taxa). Conversely, other studies based on a regional scale have found that shrubland is more diverse than tropical dry forest (Valiente-Banuet et al., 2000). We suggest these differences could be due to higher alpha diversity (site richness) in tropical dry forest at local level but higher beta diversity (richness in all patches) in shrubland at regional level. Furthermore, high species richness in semi-arid environments have been linked with species facilitation processes (Espinosa et al., 2011). However, in our area it seems to be more related with higher humidity levels and more microhabitats for plants (Murphy and Lugo, 1986). This has been documented for other taxa in the region such as mycorrhizal species (Camargo-Ricalde and Esperón-Rodríguez, 2005), and carnivores (Ramírez Pulido and Martínez Vázquez, 2007). Our results show that there are significant differences between the quadrats surveyed when considering richness and evenness, but not for the Shannon index. The Tukey test revealed only a difference between CM and VA (Table 3). The latter could be due to insufficient sampling effort, despite the fact we covered the recommended area (10%) to identify plant diversity (Sánchez-Lalinde and Pérez-Torres, 2008). The disturbance index proved useful for determining disturbance level among the different sampling areas in a simplistic manner. This study assumed that an additive approach to assessing the impact of different disturbances would be appropriate. However, it is necessary to generate an index considering the relationships and intensity of each variable with disturbance levels as they have a varied influence when generating changes in species diversity and composition. Furthermore, it has been recorded how some disturbances can have a long term effect over the environment changing original plant species composition and abundance (Espinosa et al., 2011; Ross, 2011) and in some cases favoring plant establishment (Hawkes and Flechtner, 2002; Ross, 2011). Examples include goat grazing and wood extraction, both of which have a stronger effect over habitat composition than other factors such as littering or hiking due to their capacity to alter plant communities over long periods of time as has been documented in other habitats in North America (Ripple and Beschta, 2008). Additionally, several plants that act as nurse plants (Castillo Landero and Valiente-Banuet, 2010) or create resource islands (Camargo-Ricalde et al. 2002) in the region are heavily exploited (Pérez-Negrón and Casas, 2007), which can promote long-term effects over species compositions. In the case of the Tehuacán-Cuicatlán Valley, species of the genera Mimosa and Prosopis L. have been documented to create resource islands (Camargo-Ricalde et al., 2003) and to function as nurse plants (Castillo-Landero and Valiente-Banuet, 2010). However, they are heavily consumed by goats, which are also considered as good dispersers for both species (for Prosopis, Baraza and Valiente-Banuet, 2008, and for Mimosa, Giordani, 2008). This in turn promotes that disturbed environments especially by grazing increase densities of both genera resulting in an increase in shrub density. Our results indicate that it is possible to select some species as indicators of disturbance due to a difference in their presence along the landscape. For instance, some genera that are used for wood extraction have a higher abundance in low disturbance areas in tropical dry forest (Thevetia, Ceiba, Acacia and Parkinsonia) and low disturbance in shrubland (Parkinsonia) (Paredes-Flores et al., 2007) compared to quadrats with high disturbance levels. With high disturbance, exploited species have changed their abundance (Willis et al., 2003). On the other hand, we found that two shrubs, Cnidoscolus tehuacanensis and Mimosa luisana, occurred in high numbers in disturbed quadrats in Cerro Colorado. In other areas, Mimosa luisana and other species from the same genera are known to be prone to encroachment (Legesse, 2010). The shrub Cnidoscolus tehuacanensis reacted different when data were analyzed by vegetation patch. In tropical dry forest C. tehuacanensis was more abundant in low disturbance areas, while in shrubland it was found more abundant in high disturbance levels. Hence, our results suggest that both species could be appropriate as disturbance indicator species in the area while for low disturbance levels, the genera Thevetia, Ceiba and Bursera could be used in tropical dry forest and Parkinsonia in shrubland. However, further sampling is necessary to determine the effectiveness of each genus. This study shows the responses of two vegetation types present in the region along a disturbance gradient with varied activities that go from fruit collection to agricultural practices. The disturbance index used herein could be useful for community management and quick assessments in the area when they need an assessment for activities such as tourism as the index is easy to apply and calculate. It is proposed that goat grazing and fruit collection can have more long term impact over the species composition as previously thought; hence, conservation plans undertaken in the area need to integrate human activities to ensure long term functionality. To cite as: Ramírez-Bravo, O. E. y L. Hernández-Santin. 2016. Plant diversity along disturbance gradient in a semi-arid ecosystem in Central Mexico. Acta Botanica Mexicana 117: 11-25.